Looking for a new and exciting way to spend a day this upcoming summer? Splish Splash Long Island opens for business on Saturday, May 27, 2017 at 10:00am. Splish Splash Long Island was voted one of the Best Water Parks in America by the Travel Channel! Splish Splash is located at 2549 Splish Splash Drive, Calverton, NY 11933, conveniently accessible from Route 25 as well as the LIE. Twist, turn and sp lash your way through thrilling New York attractions! There is a slide for everyone at Splish Splash. Some of the most frequented attractions include the Dinosaur Falls Tube Slide, the Cliff Diver Extreme Body Slide, and Dr. Von Dark’s Tunnel of Terror Tube Slide. Looking for a great place to stay cool and relax? Take a gentle float down the Lazy River or simply relax at Soak City. For those seeking a bit more excitement, catch some waves at Kahuna Bay Wavepool and Surf City. 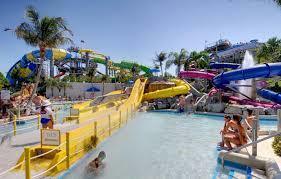 There are plenty of Long Island attractions for younger kids at Splish Splash! Younger kids can slide down Elephant Slide, swing on the tentacles of a giant octopus at the Octopus Pool, and climb ropes at Monsoon Lagoon. Parents, too, can join in on the fun at Pirates Cove, an interactive pirate ship that includes water cannons, climbing ropes, and slides. There is also a fun filled calendar of shows throughout the summer. Parrot Trainer Weldon Middlebrooks returns again this year with his Amazing Parrots in an all new Salute to the American Flag. Watch in amazement as these INCREDIBLE birds present a “Bird’s Eye View” of American History. Planning a birthday party for children this summer? Splish Splash Long Island is the perfect place for kids’ birthday parties. More information on Splish Splash waterpark, including tickets & season passes, can be found at https://www.splishsplash.com/.